During this session, you will learn about the current refugee situation, ways you can get involved, and the LFS training and application process. 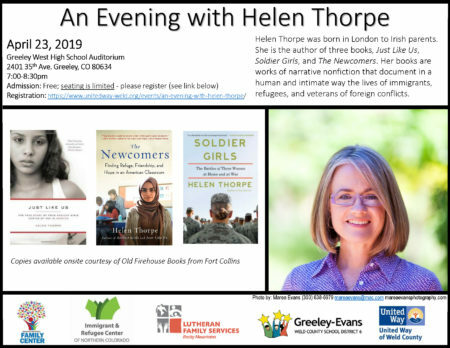 You will also hear a first person story from a refugee settled in Denver. We strive to foster friendship and understanding between the welcoming community and refugees, so this is a great first step towards learning more and getting involved. Parking: There are limited parking spaces available at the church, and additional parking at our office down the street: 1600 Downing Street, Denver, CO 80218. There is also plenty of free street parking. Your car WILL NOT be towed using either of these lots after 5:30pm. Wheelchair Entrance: Belong Church is a historic building. While it does have a wheelchair accessible entrance, it is not the main door. Please indicate on the registration form if you need the wheelchair accessible entrance so we can make sure it is available to you. ​Food: You are welcome to bring food and a beverage as long as it is not a distraction for others or yourself. Children: We encourage you to bring children if you plan to have them involved. We do ask that you are considerate if you bring babies and toddlers as the acoustics in the facility can make it quite distracting for those attending.